Agrani Bank holds "Zonal and Corporate Branch Heads Conference-2017"
Agrani Bank Limited held its "Zonal Heads and Corporate Branch Heads Conference-2017" on Saturday, February 11, 2017 at Le Meridien Hotel in Dhaka. 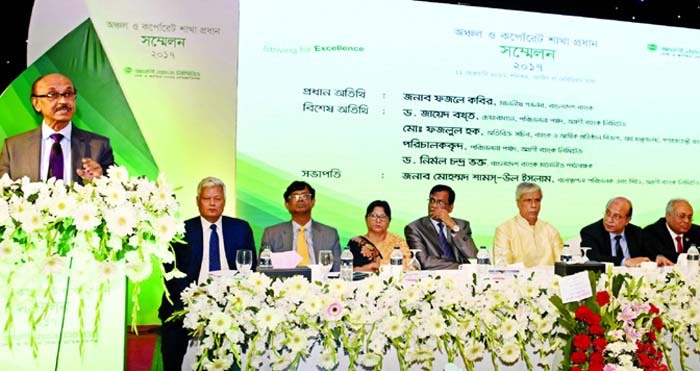 Bangladesh Bank Governor Fazle Kabir inaugurated the auspicious annual conference as chief guest. While Additional Secretary, Bank and Financial institutions division Md. Fazlul Haque, Chairman Dr. Zaid Bakht and Directors of the Board of Directors of the Bank and Bangladesh Bank observer Nirmol Chandra Vakto were present as special guests. Fazle Kabir instructed to prevent new classification and to provide all out efforts to recover classified and written off loans, by rigorous follow-up and proper management of suits. He also emphasised on importance of quality of services, automation and Internal Control and Compliance of the Bank. He expressed his desire to achieve the business targets of 2017 assigned by the Bank management. Managing Director and CEO of Agrani Bank Mohammad Shams-ul Islam, and top Executives of the Bank were also present on the occasion. All zonal heads and corporate branch heads of the bank took part in the conference.